Phosphorus deficiency is a major constraint to crop production due to rapid binding of the applied phosphorus into fixed forms not available to the plants. Microbial solubilization of inorganic phosphates has been attributed mainly to the production of organic acids. Phosphate-solubilizing microorganisms enhance plant growth under conditions of poor phosphorus availability by solubilizing insoluble phosphates in the soil. This paper describes the production of organic acids during inorganic phosphate solubilization and influence on plant growth as a function of phosphate solubilization by fluorescent Pseudomonas. Nineteen phosphate-solubilizing fluorescent Pseudomonas strains of P. fluorescens, P. poae, P. trivialis, and Pseudomonas spp. produced gluconic acid, oxalic acid, 2-ketogluconic acid, lactic acid, succinic acid, formic acid, citric acid and malic acid in the culture filtrates during the solubilization of tricalcium phosphate, Mussoorie rock phosphate, Udaipur rock phosphate and North Carolina rock phosphate. The strains differed quantitatively and qualitatively in the production of organic acids during solubilization of phosphate substrates. Cluster analysis based on organic acid profiling revealed inter-species and intra-species variation in organic acids produced by Pseudomonas strains. The phosphate-solubilizing bacterial treatments P. trivialis BIHB 745, P. trivialis BIHB 747, Pseudomonas sp. BIHB 756 and P. poae BIHB 808 resulted in significantly higher or statistically at par growth and total N, P and K content over single super phosphate treatment in maize. These treatments also significantly affected pH, organic matter, and N, P, and K content of the soil. The results implied that organic acid production by Pseudomonas strains is independent of their genetic relatedness and each strain has its own ability of producing organic acids during the solubilization of inorganic phosphates. Significant difference in plant growth promotion by efficient phosphate-solubilizing Pseudomonas strains point at the need for selecting potential strains in plant growth promotion experiments in conjunction with various phosphate substrates for their targeted application as bioinoculants. Phosphorus (P) is an essential macronutrient often limiting the plant growth due to its low solubility and fixation in the soil. Improving soil fertility by releasing bound phosphorus by microbial inoculants is an important aspect for increasing crop yield. Phosphorus release from insoluble phosphates reported for several soil microorganisms has been attributed mainly to the production of organic acids and their chelation capacity [1–3]. Direct periplasmic oxidation of glucose to gluconic acid is considered as the metabolic basis of inorganic phosphate solubilization by many Gram-negative bacteria as a competitive strategy to transform the readily available carbon sources into less readily utilizable products by other microorganisms [1, 4]. Increased solubilization of fixed soil phosphates and applied phosphates ensuring higher crop yields has been reported on inoculation of phosphate-solubilizing bacteria including Pseudomonas, Bacillus, Rhizobium, Micrococcus, Flavobacterium, Burkholderia, Achromobacter, Erwinia, and Agrobacterium [5, 6]. Several Pseudomonas species have been reported among the most efficient phosphate-solublizing bacteria and as important bio-inoculants due to their multiple biofertilizing activities of improving soil nutrient status, secretion of plant growth regulators, and suppression of soil-borne pathogens [5, 7–9]. Soils in the cold deserts of Lahaul and Spiti in the Indian trans-Himalayan region latitude 31° 44' 57" and 32° 59' 57" North and 76° 46' 29" and 78° 41' 34" East are often with low moisture status, high alkalinity, and low organic matter content. The nutritional problems in such soils are often specific in respect of the low phosphorus availability resulting from their high phosphorus-fixing capacity due to high calcium content . The vast potential of microorganisms for improving productivity in the region remains unexploited . Previously we have reported the isolation, selection, and characterization of stress-tolerant and efficient phosphate-solubilizing fluorescent Pseudomonas from the cold deserts of the Himalayas [8, 9]. The aim of the present study was to explicate organic acid production during solubilization of inorganic phosphates and effect on plant growth as a function of phosphate solubilization by fluorescent Pseudomonas. Nineteen phosphate-solubilizing fluorescent Pseudomonas included in the present studies were isolated from the rhizosphere of Hippophae rhamnoides growing in the cold deserts of Lahaul and Spiti in the trans-Himalayas and characterized based on their phenotypic characters and 16S rDNA gene sequencing [8, 9]. The bacterial strains were maintained at -70°C in nutrient broth supplemented with 20% (v/v) glycerol. The bacterial strains grown in triplicate in 10 ml NBRIP broth supplemented with 0.5% tricalcium phosphate (TCP), Mussoorie rock phosphate (MRP), Udaipur rock phosphate (URP) and North Carolina rock phosphate (NCRP) at 28°C for 5 days at 180 rpm in a refrigerated incubator shaker (Innova Model 4230, New Brunswick Scientific, USA) were centrifuged at 10,000 rpm for 10 min. and passed through 0.22 μm nylon filter. Quantitative estimation of P-liberated from inorganic phosphates was done using vanado-molybdate method as described earlier . Detection and quantification of organic acids was done on Waters 996 High Performance Liquid Chromatogram (HPLC) equipped with PDA detector, Waters 717 plus autosampler, Waters 600 controller, Waters™ pump, Waters inline degasser AF, and Lichrosphere RP-18 column 250 mm × 4.6 mm and 5 μm particle size (Merck, Germany). The mobile phase was 0.1% ortho-phosphoric acid (Merck, Germany) in the gradient of flow rate as given in Table 1. 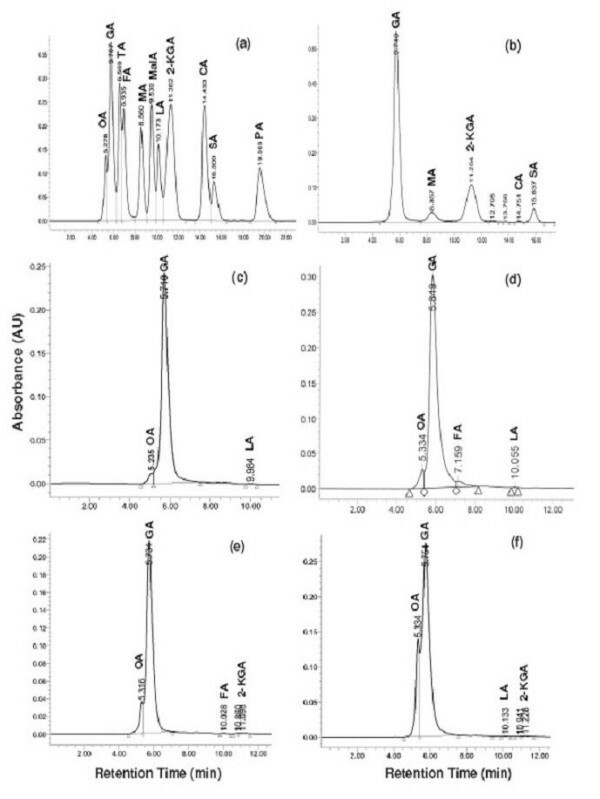 Eluates were detected at λ 210 nm and identified by retention time and co-chromatography by spiking the sample with the authentic organic acids. The organic acids were quantified by reference to the peak areas obtained for the authentic standards for gluconic acid (Sigma-Aldrich, USA), 2-ketogluconic acid (Sigma, USA), and lactic acid, oxalic acid, malic acid, succinic acid, formic acid, citric acid, malonic acid, propionic acid and tartaric acid (Supelco, USA). Each replicate was analyzed in a single run on HPLC for 76 samples for the four phosphate substrates. The values were presented as the mean of three replicates. The bacterial strains grown in 20 ml trypticase soya broth (TSB) for 48 h at 28°C were centrifuged at 10,000 rpm for 10 min. and the pellets suspended in 0.85% NaCl (OD600 = 1.0). The bacterial suspensions were separately mixed with sterilized activated charcoal (4:6 v/w) to give a CFU of approximately 107/g of charcoal-based bacterial inoculants. Seeds of Zea mays var. Girija surface sterilized with 20% sodium hypochlorite for 3 min. and washed thrice with sterile distilled water were germinated at 25°C in moist sterile vermiculite. Uniformly germinated seeds were coated with the water slurry of charcoal-based microbial inoculants (approx. 5 × 105 CFU/seed) and two seeds per pot sown in 15 cm diameter pots filled with 2 kg non-sterilized sandy-loam soil. The soil used had pH 6.96, organic matter 3.1%, available N 0.03%, available P 0.0011%, available K 0.013% and available Ca 0.028%. The germinated seeds treated with the water slurry of sterilized activated charcoal without inoculum were used for the control treatments. N and K were applied in the form of ammonium sulfate @ 240 kg N/ha, and muriate of potash @ 80 kg K/ha, respectively. P was applied @ 120 kg P/ha either as single super phosphate (SSP) or tricalcium phosphate (TCP) according to the various treatments. The phosphate-solubilizing bacterial (PSB) treatments included one P. fluorescens strain, three P. poae strains, ten P. trivialis strains, and five Pseudomonas spp. strains in combined application with NPK with TCP as the phosphate source. TCP was chosen as phosphate substrate since P-deficiency in soils of the cold deserts of Lahaul and Spiti is attributed mainly to the presence of insoluble di- and tricalcium phosphates. The influence of PSB treatments on plant growth and soil properties was evaluated in comparison to the uninoculated control treatments with or without TCP and SSP. The pots were placed in a complete randomized block design with four replications under 550 μM photon m-2 s-1 mixed incandescent and fluorescent illumination, 16/8 h light/dark cycle and 50–60% RH at 25 ± 2°C in an Environment Control Chamber. The plants were removed carefully under a gentle flow of tap water after 90 days of sowing. Data on root length, plant height (aerial parts), root dry weight and shoot dry weight were recorded. The samples were oven-dried at 70°C for 3 days to a constant weight for determining the dry weight. The soil samples were air dried and sieved for determining pH, available N, P, K, Ca and organic matter content. The plant samples were oven-dried and powdered for estimation of total N, P and K. Organic matter was determined by the modified Walkley and Black method . Estimation of total N was done by modified Kjeldahl's method, total P by vanado-molybdate yellow colour method, total and available K by flame photometric method, and available Ca in ammonium-acetate extracts . Estimation of available P was estimated by sodium biocarbonate method  and available N by alkaline permanganate method . Randomized block design with two factor factorial arrangement was adopted for conducting the experiments. The data were subjected to one-way analysis of variance (ANOVA) and the mean of treatments compared by Duncan's Multiple Range Test at p ≤ 0.01 using SPSS Software version 7.5. Cluster analysis based on the organic acid profiles was performed using STATISTICA data analysis software system version 7 (StatSoft® Inc. Tulsa, USA, 2004). HPLC analysis of the culture filtrates was done to identify and quantity the organic acids produced during the solubilization of TCP, MRP, URP and NCRP by Pseudomonas fluorescens strain, three Pseudomonas poae strains, ten Pseudomonas trivialis strains, and five Pseudomonas spp. strains (Fig. 1). During TCP solubilization all strains showed the production of gluconic and 2-ketogluconic acids (Table 2). Apart from one Pseudomonas sp. strain no other strain showed oxalic acid production. All strains exhibited the production of malic acid excepting one Pseudomonas sp. strain and succinic acid excluding one Pseudomonas sp. strain. The production of lactic acid was restricted to one strain of both P. trivialis and Pseudomonas sp., formic acid to six P. trivialis, P. fluorescens and two Pseudomonas spp. strains, and citric acid to three P. trivialis strains and one strain each of P. poae and Pseudomonas sp., and P. fluorescens strain. HPLC chromatograms of authentic organic acids (a) and culture supernatant of Pseudomonas trivialis strain BIHB 747 grown for 5 days at 28°C in NBRIP broth with tricalcium phosphate (b), Udaipur rock phosphate (c), Mussoorie rock phosphate (d), North Carolina rock phosphate (e), and North Carolina rock phosphate spiked with OA (f). OA = oxalic acid, GA = gluconic acid, TA = tartaric acid, FA = formic acid, MA = malic acid, MalA = malonic acid, LA = lactic acid, 2-KGA = 2-ketogluconic acid, SA = succinic acid, CA = citric acid and PA = propionic acid. Organic acid production by fluorescent Pseudomonas during tricalcium phosphate solubilization. Values are the mean of three replicates ± standard error of the mean; ND = not detected; 2-KGA = 2-ketogluconic acid. During URP solubilization the production of oxalic and gluconic acid was detected for all the strains (Table 3). The production of other organic acids was restricted to some strains: 2-ketogluconic acid to three Pseudomonas spp. strains and one strain each of P. trivialis, P. poae and P. fluorescens; lactic acid to five P. trivialis, P. fluorescens and two Pseudomonas spp. strains; succinic acid to one strain each of P. trivialis, P. fluorescens and Pseudomonas sp. ; formic acid to two P. trivialis strains; and malic acid to four P. trivialis, two P. poae and four Pseudomonas spp. strains. None of the strains showed citric acid production during URP solubilization. Organic acid production by fluorescent Pseudomonas during Udaipur rock phosphate solubilization. During MRP solubilization the production of oxalic and gluconic acid was also detected for all the strains (Table 4). The production of 2-ketogluconic acid was shown by one Pseudomonas poae, P. fluorescens and four Pseudomonas spp. strains, lactic acid by five P. trivialis, one P. poae and three Pseudomonas spp. strains, succinic acid by three Pseudomonas spp. strains, formic acid by three P. trivialis and three Pseudomonas spp. strains, formic acid by P. fluorescens and three P. trivialis strains, malic acid by two P. trivialis, one P. poae, P. fluorescens and four Pseudomonas spp. strains, and citric acid by one Pseudomonas sp. strain. Organic acid production by fluorescent Pseudomonas during Mussoorie rock phosphate solubilization. In NCRP solubilization the production of oxalic acid and gluconic acid was detected for all the strains (Table 5). The production of other organic acids was limited to some strains: 2-ketogluconic acid to five P. trivialis, two P. poae, P. fluorescens and three Pseudomonas spp. strains; lactic acid to three P. trivialis and four Pseudomonas spp. strains; succinic acid to one strain each of P. poae, P. fluorescens and Pseudomonas sp. ; formic acid to P. fluorescens strain; citric acid to one strain each of P. poae and Pseudomonas sp. ; and malic acid to one P. trivialis, P. fluorescens and three Pseudomonas spp. strains. Organic acid production by fluorescent Pseudomonas during North Carolina rock phosphate solubilization. Quantitative difference in the production of organic acids was observed during the solubilization of phosphate substrates by Pseudomonas strains (Tables 2, 3, 4, 5). The quantities of organic acids produced during TCP solubilization ranged from 216.7–19340 μg/ml gluconic acid, 14.3–532.3 μg/ml 2-ketogluconic acid, 96–2249 μg/ml succinic acid, 23.8–132.0 μg/ml formic acid, 25.5–65.2 μg/ml citric acid, and 75–4215 μg/ml malic acid. Lactic acid production shown only by P. trivialis BIHB 728 and Pseudomonas sp. BIHB 804 was 53.7 and 49.3 μg/ml, respectively. Oxalic acid production detected only for Pseudomonas sp. BIHB 751 was 318.7 μg/ml during TCP solubilization. Organic acid production during URP solubilization varied from 8–26.6 μg/ml oxalic acid, 631.7–10903 μg/ml gluconic acid, 16.4–255 μg/ml 2-ketogluconic acid, 41.3–164 μg/ml lactic acid, 56.1–108 μg/ml succinic acid, and 34.5–4350 μg/ml malic acid. Formic acid production only by P. trivialis BIHB 745 and P. trivialis BIHB 763 was 35.1 and 93.6 μg/ml, respectively. During MRP solubilization the quantities of organic acids estimated in the culture filtrates were 10.6–39.3 μg/ml oxalic acid, 7076.3–15727 μg/ml gluconic acid, 18.4–468 μg/ml 2-ketogluconic acid, 36.8–50.8 μg/ml lactic acid, 136.0–349.7 μg/ml succinic acid, 70.4–114.4 μg/ml formic acid, and 32.3–2802 μg/ml malic acid. Citric acid production observed for only Pseudomonas sp. BIHB 811 was 22.3 μg/ml during MRP solubilization. Organic acids during NCRP solubilization ranged from 8.9–17.1 μg/ml oxalic acid, 2549–6035 μg/ml gluconic acid, 10.1–32.7 μg/ml 2-ketogluconic acid, 38.8–54.3 μg/ml lactic acid, 45.1–75.1 μg/ml succinic acid, and 33–415 μg/ml malic acid. Citric acid production shown by the two strains P. poae BIHB 752 and Pseudomonas sp. BIHB 756 was 26.1 and 29.5 μg/ml, respectively. Pseudomonas fluorescens BIHB 740 produced 59.3 μg/ml formic acid during NCRP solubilization. 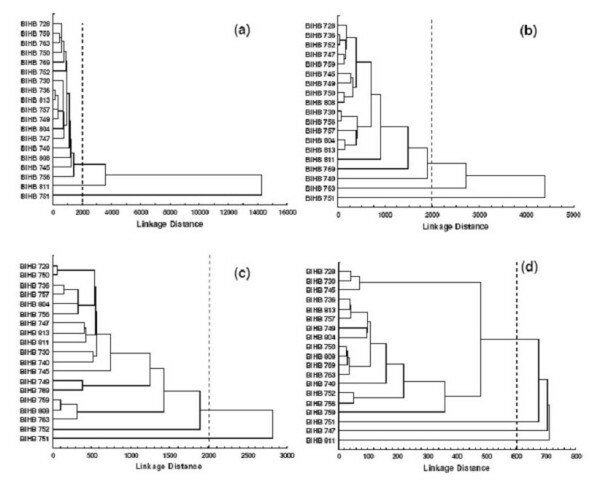 Cluster analysis based on the organic acid profiles during TCP, URP, MRP and NCRP solubilization generated Pseudomonas groups with strains belonging to the same or different species (Fig. 2). For TCP solubilization a single cluster was obtained at 2000 linkage distance, while Pseudomonas sp. BIHB 751 and Pseudomonas sp. BIHB 811 stood outside the cluster (Fig. 2a). Pseudomonas sp. BIHB 751 differed from the other strains in producing oxalic acid, lack of succinic acid production, and producing the lowest quantity of gluconic acid and the highest quantity of 2-ketogluconic acid. Pseudomonas sp. BIHB 811 showed dissimilarity in not producing malic acid. In URP solubilization a single cluster of three sub-clusters and single branches of Pseudomonas sp. BIHB 811, P. trivialis BIHB 769 and P. fluorescens BIHB 740 were formed at 2000 linkage distance, while Pseudomonas sp. BIHB 751 and P. trivialis BIHB 763 stood independently outside the cluster (Fig. 2b). Pseudomonas sp. BIHB 751 differed in producing the lowest quantity of gluconic acid and the highest quantities of 2-ketogluconic and malic acids. Pseudomonas trivialis BIHB 763 was separate from other strains in producing the highest quantities of gluconic and formic acids (Fig. 2b). During MRP solubilization a single cluster including six sub-clusters and two single branches of P. trivialis BIHB 745 and P. poae BIHB 752 were observed at 2000 linkage distance. Pseudomonas sp. BIHB 751 stood separately outside the cluster in producing the lowest quantity of gluconic acid and the highest quantity of malic acid (Fig. 2c). In NCRP solubilization P. trivialis BIHB 747, Pseudomonas sp. BIHB 751 and Pseudomonas sp. BIHB 811 stood outside the cluster as independent branches at 600 linkage distance (Fig 2d). The cluster incorporated 5 sub-clusters and separate branches of Pseudomonas sp. BIHB 740 and P. trivialis BIHB 759. Pseudomonas trivialis BIHB 747 differed in the highest gluconic acid production, Pseudomonas sp. BIHB 751 in the highest malic acid production, and Pseudomonas sp. BIHB 811 in producing the lowest quantity of gluconic acid and the highest quantity of 2-ketogluconic, lactic, and succinic acids. Dendrogram based on organic acid profiles of phosphate-solubilizing fluorescent Pseudomonas grown in NBRIP broth with (a) tricalcium phosphate, (b) Udaipur rock phosphate, (c) Mussoorie rock phosphate, and (d) North Carolina rock phosphate after 5 days incubation at 28°C. Significant difference was observed for the growth parameters in maize among PSB treatments and uninoculated control treatments (Table 6). The plant height was significantly higher in fifteen PSB treatments and NPSSPK over NP0K. Increment in height was significantly higher with NPTCPK+Pt BIHB 759 and significantly lower with NPTCPK+P sp BIHB 751 over NPSSPK. Other PSB treatments were statistically at par with NPSSPK. Nine PSB treatments exhibited significantly higher plant height over NPTCPK. Plant height increase was the highest with NPTCPK+Pt BIHB 759, followed by NPTCPK+Pt BIHB 763, NPTCPK+Pt BIHB 745, NPTCPK+Pp BIHB 808, NPTCPK+Pt BIHB 757, and NPTCPK+Pt BIHB 747 treatments. Influence of fluorescent Pseudomonas on growth and nutrient content of maize after 90 days in Environment Control Chamber. The shoot dry weight was significantly higher in seven PSB treatments over NP0K, NPTCPK and NPSSPK. The highest shoot dry weight with NPTCPK+P sp BIHB 813 was statistically at par with NPTCPK+Pp BIHB 730, NPTCPK+Pt BIHB 747, NPTCPK+Pt BIHB 769, NPTCPK+Pt BIHB 745, NPTCPK+P sp BIHB 756 and NPTCPK+Pf BIHB 740. The root length was significantly higher in fifteen PSB treatments over NP0K and thirteen PSB treatments over NPTCPK and NPSSPK. The maximum increase was obtained with NPTCPK+Pt BIHB 736, followed by NPTCPK+Pt BIHB 745, NPTCPK+Pt BIHB 769, NPTCPK+Pp BIHB 730 and NPTCPK+P sp BIHB 756. The treatments NPTCPK and NPSSPK were statistically at par with NP0K. The root dry weight was significantly higher in NPTCPK+Pt BIHB 749 over other PSB treatments, NP0K, NPTCPK and NPSSPK. The treatments NPTCPK+Pt BIHB 745, NPTCPK+Pt BIHB 747 and NPTCPK+Pt BIHB 757 were statistically at par and showed significantly higher root dry weight over NP0K, NPTCPK and NPSSPK. The treatments showed significant difference in the nutrient content of roots and shoots (Table 6). The shoot N was statistically higher in seven PSB treatments over NP0K and two PSB treatments over NP0K, NPTCPK and NPSSPK. A non-significant difference in the shoot N was observed with NP0K, NPTCPK and NPSSPK. The shoot P was significantly higher in ten PSB treatments over NP0K, NPTCPK and NPSSPK. The highest P content obtained with NPTCPK+Pt BIHB 745. The treatments NPTCPK and NPSSPK were statistically at par with NP0K. The shoot K was significantly higher in NPTCPK+Psp BIHB 756, NPTCPK+Pt BIHB 759 and NPTCPK+Pt BIHB 745 over NP0K, NPTCPK and NPSSPK. The root N was significantly higher in eight PSB treatments over NP0K, NPTCPK and NPSSPK. The N content was statistically at par in NP0K, NPTCPK and NPSSPK. The highest N was obtained with NPTCPK+Pt BIHB 736. The root P was significantly higher in three PSB treatments over NPSSPK. The maximum increase was obtained with NPTCPK+Pt BIHB 745, followed by NPTCPK+Pp BIHB 752 and NPTCPK+P sp BIHB 756. The P content was significantly higher in NPSSPK over NP0K and NPTCPK. The root K was significantly higher in NPTCPK+Pt BIHB 745 and NPTCPK+Pt BIHB 728 over NP0K, NPTCPK and NPSSPK. Other treatments were statistically at par with NPTCPK and NPSSPK. The soil pH, organic matter and available N, P, K contents were significantly affected by PSB treatments (Table 7). The final pH with non-significant difference among various treatments was less than the initial pH. The highest decrease recorded with NPTCPK+Pt BIHB 757 was statistically at par with all other PSB treatments but significantly lower than NP0K, NPTCPK and NPSSPK. The organic matter content was significantly higher in four PSB treatments than NP0K, NPTCPK and NPSSPK. Influence of fluorescent Pseudomonas on soil properties after 90 days in maize in Environment Control Chamber. Values are the mean of 8 replicates. N and K applied as ammonium sulfate @ 240 kg N/ha, and muriate of potash @ 80 kg K/ha to all the treatments, respectively. TCP = tricalcium phosphate (120 kg P/ha). SSP = single super phosphate (120 kg P/ha). Values with common letters in each column do not differ statistically according to Duncan's Multiple Range Test at p ≤ 0.01. Pt = P. trivialis, Pp = P. poae, Pf = P. fluorescens, and P sp = Pseudomonas sp. The soil N content was significantly higher in five PSB treatments than NP0K, NPTCPK and NPSSPK and statistically at par among NP0K, NPTCPK and NPSSPK. The soil P content was significantly higher in three PSB treatments over NP0K, NPTCPK and NPSSPK. The highest available P content was obtained with NPTCPK+Pt BIHB745 among PSB treatments and with NPSSPK among uninoculated treatments. The soil K content was significantly higher in nine PSB treatments than other PSB treatments, NP0K, NPTCPK and NPSSPK. The highest available K was recorded for NPTCPK+P sp BIHB 756. The available Ca was significantly higher in three PSB treatments than other PSB treatments, NP0K, NPTCPK and NPSSPK. The organic acid production during solubilization of inorganic phosphates by the efficient phosphate-solubilizing strains of Pseudomonas trivialis, Pseudomonas poae, Pseudomonas fluorescens and Pseudomonas spp., corroborated their involvement in phosphate solubilization [1, 3, 6]. Gluconic acid was the major organic acid produced as reported during phosphate solubilization by Pseudomonas sp. , P. fluorescens , Azospirillum spp. , Citrobacter sp. , and Pseudomonas corrugata . The production of 2-ketogluconic, oxalic, malic, lactic, succinic, formic and citric acid in small quantities by Pseudomonas strains have also been reported during phosphate solubilization by Arthrobacter ureafaciens, Arthrobacter sp., Bacillus coagulans, B. megaterium, Chryseobacterium sp., Citrobacter koseri, Delftia sp., Enterobacter intermedium, Pseudomonas fluorescens, Rhodococcus erythropolis and Serratia marcescens [3, 6, 16, 20, 21]. None of Pseudomonas strains produced propionic acid unlike Bacillus megaterium strains during phosphate solubilization . The results indicated that the quantity of organic acids produced differed with the nature of phosphate substrates and Pseudomonas strains (Tables 2, 3, 4, 5). The higher solubilization of TCP than URP, MRP and NCRP could possibly be due to the higher gluconic acid production in presence of TCP. The lower production of gluconic acid and lower TCP solubilization by Pseudomonas sp. BIHB 751 than other Pseudomonas strains substantiated the involvement of gluconic acid in solubilization of calcium-bound phosphates. Succinic acid also appeared contributing to TCP solubilization as it was produced by high TCP-solubilizing strains and not by low TCP-solubilizing Pseudomonas sp. BIHB 751 strain. The lack of oxalic acid production by efficient phosphate-solubilizing Pseudomonas strains signified non involvement of oxalic acid in TCP solubilization though this acid has been implicated besides citric, gluconic, lactic and succinic acids in phosphate solubilization in alkaline vertisols . Pseudomonas sp. strain BIHB 751 producing the highest quantity of 2-ketogluconic acid but showing the lowest TCP and URP solubilization also differed from Enterobacter intermedium reported for the enhanced phosphate solubilization with increasing 2-ketogluconic acid production . Likewise, no relationship could be ascertained between the quantity of organic acids produced and the solubilization of rock phosphates by Pseudomonas strains as the highest solubilization observed for NCRP among the rock phosphates was coupled to the lowest production of total organic acids (Tables 3, 4, 5). Previously also the quantities of solubilized phosphorus could not be correlated with the quantities of organic acids in the culture medium . UPR, MRP and NCRP have fluorapatite structure with the highest substitution of phosphate with carbonate in NCRP . The higher solubilization and lowered quantities of organic acids detected in the presence of NCRP could be due to the higher reactivity and greater diversion of organic acids in the neutralization of free carbonates in the solubilization of NCRP as compared to MRP and URP [23, 24]. Likewise, the higher solubilization and higher production of organic acids in the presence of TCP could be attributed to its amorphous nature with simple structure and absence of any free carbonates as compared to the crystalline lattice structure of the rock phosphates . Cluster analysis of organic acid profiles generated different groups revealing inter and intra-specific variation in the production of organic acids by Pseudomonas strains (Fig. 2). The strains clustered together and those standing outside the clusters or sub-clusters belonged to different Pseudomonas species characterized previously by 16S rRNA gene sequencing [8, 9]. The strains standing outside the clusters differed qualitatively and/or quantitatively from other strains in the production of organic acids (Tables 2, 3, 4, 5). The results implied that Pseudomonas strains are independent of their genetic relatedness in their phosphate-solubilizing ability and organic acid production even under similar set of culture conditions. Phosphate solubilization is a complex phenomenon which depends on the nutritional, physiological and growth conditions of the culture . The enhanced growth and higher N, P and K contents in maize with PSB treatments underlined the advantage of phosphate-solubilizing activity of microorganisms for plant growth promotion (Table 6 and 7). The increased growth and P uptake have been reported on PSB inoculations with Pseudomonas sp. and Serratia marcescens in maize , Pseudomonas fluorescens in peanut , Bacillus circulans in mungbean  and Pseudomonas sp. in wheat . The TCP solubilization in soil by fluorescent Pseudomonas strains as evidenced by in vitro TCP solubilization, increased soil P availability and higher plant P content would be useful particularly in the cold deserts of Lahaul and Spiti where soil P deficiency is attributed mainly to the reaction of P with calcium carbonate and calcium sulphate forming insoluble di- and tricalcium phosphates. The rock phosphates recommended for acid soils are reportedly not effective in alkaline soils as P source for the crops . The significantly higher plant growth and N, P, and K content in plant tissues and soil with some PSB treatments over NPSSPK might be due to the immobilization of applied P by native soil microbiota and physico-chemical reactions in the soil. The increased and continuous P availability in the soil promotes biological nitrogen fixation . No correlation among TCP solubilization, production of organic acids and plant growth promotion could be established as the highest solubilization and plant growth promoting activity was observed for P. trivialis BIHB 745 not showing the highest organic acid production. However, the lowest organic acid production and plant growth promotion by Pseudomonas sp. BIHB 751 showing the lowest TCP solubilization suggested that phosphate solubilization is an important mechanism of plant growth promotion. Pseudomonas strains exhibiting high TCP solubilization in vitro differed significantly in enhancing the plant growth in the soil indicating interplay of some other growth factors besides phosphate-solubilization (Tables 2, 6, and 7). Apart from making P available to the plants, phosphate-solubilizing microorganisms improve plant health directly by the production of phytohormones . Pseudomonas strains have been reported to vary in their ability for phytohormone production [32–34]. The bacterial strains also differ in utilizing root exudates in producing biologically active substances and root colonizing ability known to influence the plant growth-promoting action of rhizobacteria . Plant-microbe interaction is a complex phenomenon with the interplay of several mechanisms and environmental factors. The decrease in soil pH in PSB treatments indicated the production of organic acids by Pseudomonas strains as also reported for phosphate-solubilizing Aspergillus niger and A. tubingensis . However, less pH decline in soil during plant growth promotion experiments than phosphate solubilization in culture medium could be due to the buffering nature of soil . The inorganic acids and H+ ions of microbial origin and H+ ions released from the plant roots during ammonium assimilation are also reported to influence the soil pH [22, 30, 37]. The studies have shown potential for plant growth promotion by P. trivialis BIHB 745, P. trivialis BIHB 747, Pseudomonas sp. BIHB 756 and P. poae BIHB 808 in the presence of TCP as the phosphate source. The native phosphate-solubilizing and stress-tolerant Pseudomonas strains are expected to cohabitate as effective microbial inoculants with the crops grown in the cold deserts of Lahaul and Spiti. The present study revealed that the innate ability of organic acid production by Pseudomonas strains is independent of their genetic relatedness. Significant difference in plant growth promotion among the efficient phosphate-solubilizing Pseudomonas strains point at the need for selecting the potential strains based on plant growth promotion in the soils supplemented with insoluble phosphates for their targeted application. The PSB strains with high potential for TCP solubilization appear promising for application in the Ca-rich and P-deficit soils in the cold deserts of Lahaul and Spiti for which field studies are required. Authors acknowledge the Director, Institute of Himalayan Bioresource Technology for providing the necessary facilities. The Council of Scientific and Industrial Research, Govt. of India, is also acknowledged for the financial support under the CSIR Network Project "Exploitation of India's Rich Microbial Wealth" (NWP 006). Thanks for the technical support are due to Mr. Ramdeen Prasad in chemical analyses and Mrs. Vijaylata Pathania for HPLC operation. The valuable suggestions by Dr. S. P. Sharma, Professor and Head and Dr. S.P. Dev, Scientist, Department of Soil Sciences, CSK HP KV (Agriculture University), Palampur (HP) are also acknowledged. PV carried out the experiments on phosphate solubilization, organic acid profiling, plant growth promotion and chemical analyses, data analyses, and manuscript writing. AG contributed in experimental designing, interpretation of results, co-ordination and supervision of the experimental work, manuscript writing and editing.